Gold remained unchanged last week at $1290 having hit a high of $1,310 and a low of $1,290. In sterling terms gold finished the week at £986 that’s down £3, and in Euros it closed at 1,147 Euros that’s down 7 euros. Silver fell 13 cents from $15.11 to $14.98 having hit a high of $15.33 and a low of $14.91. In sterling terms, it closed at £11.45, that’s down 14 pence and in Euros it closed at 13.26 euros, that’s down 0.21 euros. The Dow Jones closed on Friday at 26,412 up 269 points on the day and down 10 points on the week, and the NASDAQ closed at 7,984 up 36 points on the day and up 46 points on the week, and the S&P 500 closed at 2,907 up 19 points on the day and up 15 points on the week. The dollar index stands at 96.97 that’s down 0.42 on the week. This week’s report is a little briefer than usual for the simple reason that markets were to some extent relatively unchanged and all operating within the upper and lower limits we have predicted for the past couple of months. Gold strengthened early last week only to fall away again on Thursday and basically move more or less sideways on Friday. Sentiment appears to have turned a little negative and from a technical point of view any move below $1280 will see gold head for $1250 which is where we expect to see gold some time within the next 2 weeks or so. The dollar although a little weaker at the end of the week has held up well considering the recent strengthening of the Euro. We certainly foresee gold reduce in price in sterling terms as BREXIT has now been delayed and therefore will, at least for now, relieve some of the downward pressure on sterling. Like gold silver markets rose initially last week but again fell away. There is strong support at $14.90 but frankly we again see silver falling below this level and heading closer towards $14.50 during the next couple of weeks. 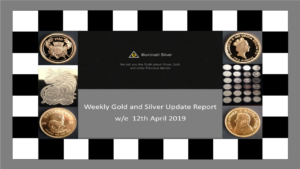 As we pointed out in our video on Friday concerning the Silver Institute Survey for last year, whilst physical coin and bar demand for silver was up, Industrial demand was down, and we foresee a further weakening in this area for 2019. Of course, from a technical point of view there is resistance at the $15.25 level and should this be surpassed then silver will head for $15.50 however our assessment is that it will reach $14.50 before it will reach $15.50. Last Wednesday we saw Core CPI for March coming in at 1% compared with an estimated 2% and on Thursday Producer Price Index for March at 0.6% compared with an estimated 0.3%. Certainly, the dovish FED minutes had an impact on the US dollar midweek, but this was more or less corrected by the end of the week. Well, we envisage a slightly weaker gold and silver price though once again no dramatic moves in either. Perhaps the best way to describe our assessment is a slow grind down to the next major support level. With little data available to affect markets next week, more attention is likely to be paid to the political environment and of course as usual all eyes on the dollar.